New Castle County, WILMAPCO & DelDOT are leading a year-long transportation and land use study for Glasgow Avenue, between U.S. 40 and SR 896/Porter Road (about 1.3 miles). The study is intended to create a “Main Street” vision plan to guide transportation improvements and land use along Glasgow Avenue. Before the construction of the 896/Glasgow bypass, this section of old SR 896 functioned as an arterial roadway with limited access points. The roadway now primarily supports local trips between businesses, the high school, medical center, and residential developments. However, due to its previous function as an arterial roadway, the street is designed to carry much higher traffic volumes than currently exist. As a result, cars tend to drive very quickly, which discourages walking and biking, and creates safety problems. With new development activity planned, this corridor will continue to face mobility and safety issues. The Glasgow Avenue Planning Study is an opportunity for community members and other stakeholders to shape future change and have input into how new development and street improvements occur over time. Among the elements to be explored are ways to make the area more pedestrian and bike-friendly, the creation of inviting gathering places and a stronger sense of place; and the integration of an appealing mix of uses to support these goals. Two public hearings have been held on this project, utilizing a workshop style meeting in which participants were asked to share ideas early in the planning process. If you were not able to attend the meeting, it’s not too late to join the conversation! 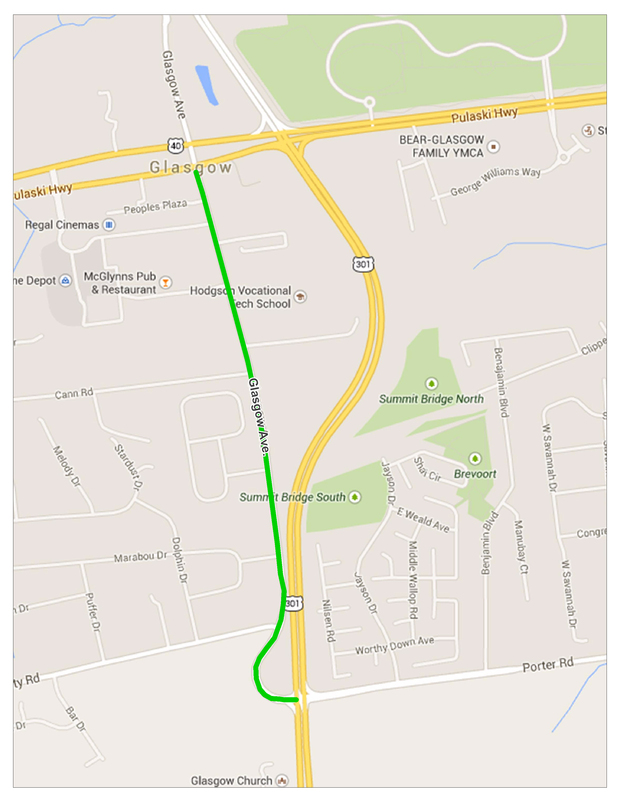 For more information visit WILMAPCO's Glasgow Avenue Main Street Study Project Page. This was recommended in DelDOT's "Year 2000 Route 40 Corridor 20-Year Transportation Plan".